In the past 2 months, Stella (our little angel of a yellow lab) has been sprayed by a skunk…twice. It’s an awful problem that I’ve learned is common for this area of Northeast Oklahoma. The first skunk encounter happened in the middle of the night when we were sleeping. Stella has a doggie door (quite the ‘lil piece of heaven, by the way. Highly recommended if you have both a dog & fenced-in backyard! ), so she occasionally lets herself out at odd hours of the night. So, when she returned inside that night something wasn’t right. From that point on we ran around the house like fools at 3am, not knowing what to do or how to go about the de-skunk odor process. It wasn’t just Stella we had to de-odor…it was our entire house. Y’all…like…even the TINIEST oil residue from the skunk spray can kling to your clothes, her fur, sheets, furniture, etc. smelling like this for ages. It was awful. We couldn’t figure out what Stella brushed up against even in the 1 short minute that she was in the house. We knew we had to act fast…but what were we to dooooo at 3am? Quarantine that precious little one. Your doggie, not the skunk. Or maybe it’s your child who was sprayed. Or … you? 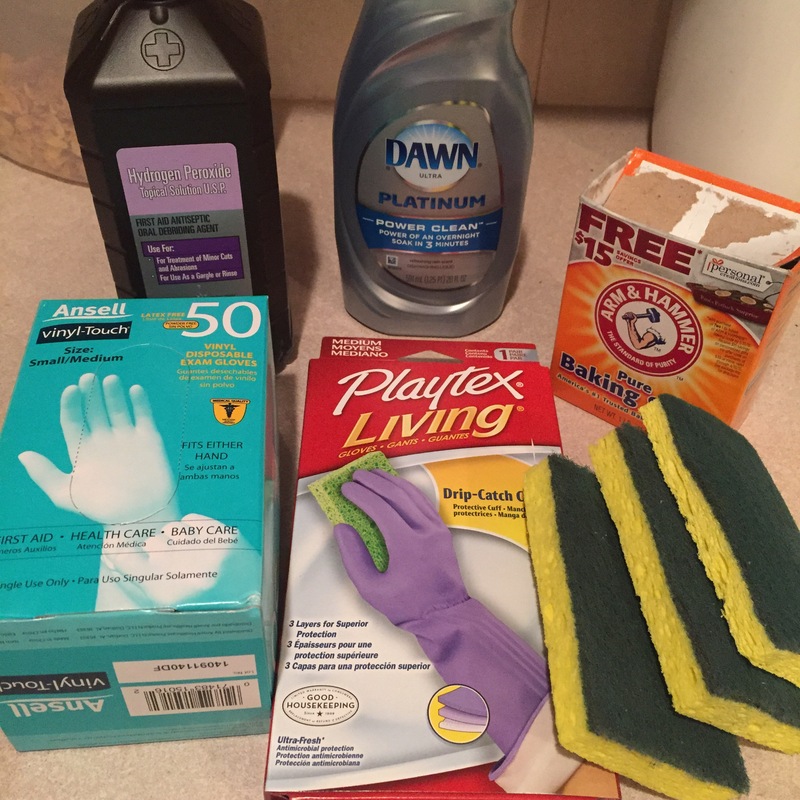 Whatever the damage – keep the poor pitiful being in quarantine while you prepare Step 4. If you waste anytime and your dog (in this case) brushes along your furniture/whatever…it will quickly keep to the fabric like it’s life depended on it. Sean and I had to throw away our comforter…but fun fact though – we didn’t like the old one anyway and I was secretly eyeing one from Pottery Barn…but was waiting for the right moment to bring it up. There’s always a silver lining to things, like this! We now have the pottery barn comforter. Win!!!! Get the cleaning scene ready. Now. Go Go Goooo! Whether it’s your tub/shower/backyard – whatever venue you choose for the wash…get ready with your chosen cleaning product right away. Suit up! See Sean…my hero…in this GLORIOUS picture from the 1st time Stella got skunked. From head to toe he was ready if she was trying to shake it off (sh-sh-sh-shake IT off!). And she did. Glad he was prepared. You should be to. Rinse. Soak. Rinse. Soap. Rinse. Whatever de-skunk remedy you choose or have available, you’ll want to first rinse off the dog/human in lukewarm water, then really work in the product/home remedy into the fur/skin (especially if you know where the affected area is) and let it sit for 10-15 minutes. Play some Enya, sing “Over the Rainbow,” maybe cry a little…that’s perfectly normal…but just be patient and let it soak. Then, break out the shampoo and do one last cleanse. That should do it! 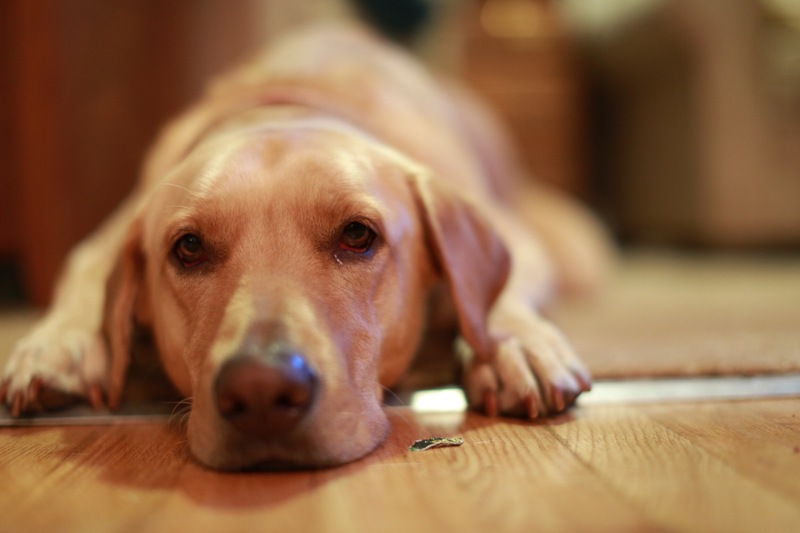 Your dog will shake, and you will hate every minute of it, so it’s a good idea to make sure you’ve wiped down all possible traces of this horrific scent. If you don’t, the scent will most certainly linger longer than you want it to. You may also have traces of the skunk odor in unforeseen places around your house. Try to remember where the skunk-infected dog/person walked inside…like…step by step. You’re going to want to wash that entire area down from “the windoooooows to the WALLS!” (-hehe). Your nausea and nostrils will thank you so much. 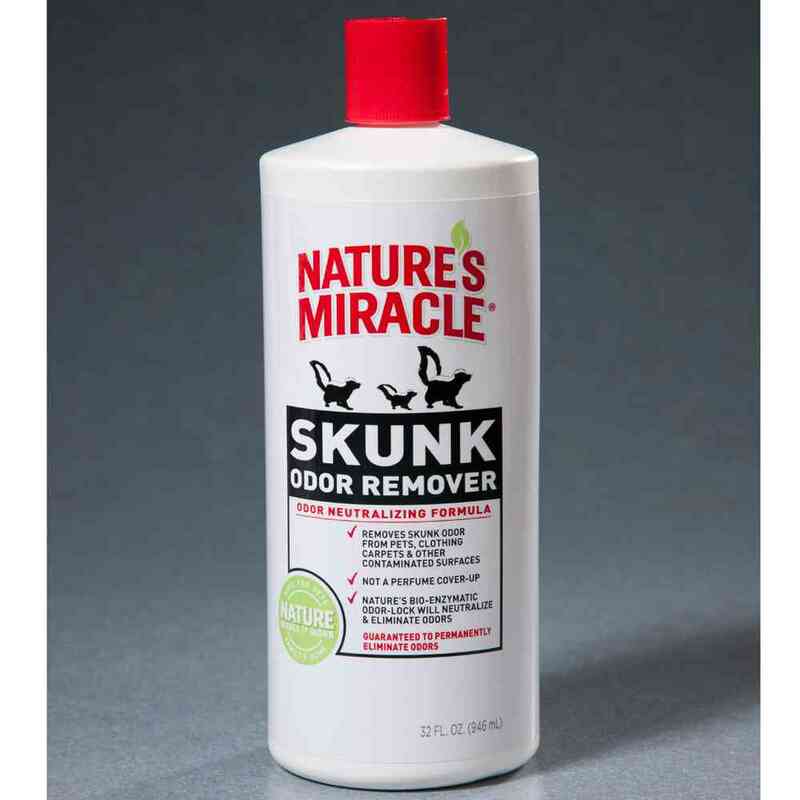 Absolutely, Keep skunk remover handy. Our dog has been skunked twice this year since moving into town in Norman. Next time, I’ll be prepared and have Enya playing in the background. How was I to know how funny the story could be from someone else’s point of view. Thank you. I remember thinking: “This isn’t funny…but looking back in a few weeks I bet it will be ;)” Sorry to hear that you had the same troubles too here in OK! Best of luck.